This entry was posted on March 18, 2019 by Sew Essential. I've been super busy at home and work the last few months so quick, satisfying sews are my focus right now. To keep things interesting I've worked with new fabric types or experimented with new silhouettes and shapes. 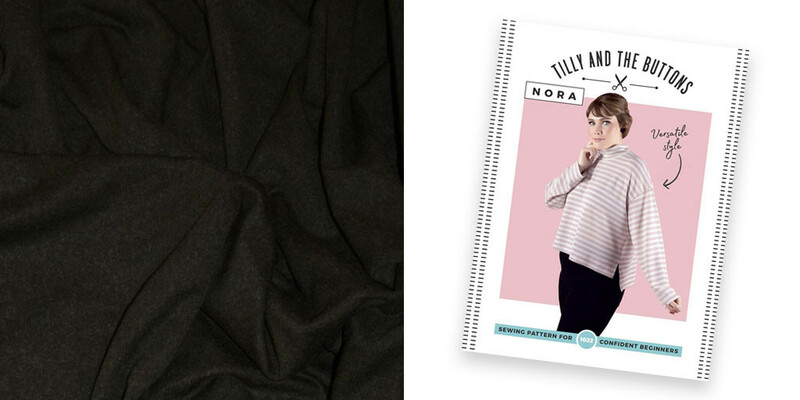 The Nora sewing pattern was an experiment with a new shape. Normally I veer towards much more fitted styles. In the Autumn I bought some baggy jumpers and really enjoyed wearing them with skinny jeans and fitted skirts. You know how you just feel really good in some outfits. More comfortable and confident? Then I started to realise I wasn't wearing some of my skinny jeans and skirts because I only had fitted tops to go with them. I'm more than happy to wear a fitted dress, but I think a combination of close fitting and loose fitting garments looks and feels more modern when wearing separates. It was time to make some looser tops - hello Nora! The Nora pattern has a dropped shoulder, options for a funnel neck or crew neck and options for a hi lo hem or longer line straight hem and short or long sleeves. I opted for the funnel neck with the hi lo hem. In the quest to stay 'on trend' I thought it would be fun to try a top that was cropped at the front as well as loose fitting. I chose our super soft, deliciously cosy Isabella wool jersey in charcoal for the fabric. I also have a tight fitting funnel neck in this same fabric, which has been washed and worn weekly during the winter for the last three years and still looks brand new. It truly is wonderful stuff. It comes in a range of colours, you can see them here. I made a size 3 (34" bust and 28" waist) and made my usual high round back and forward shoulder adjustments, 1/2" in each case. The sizes range from a 30" bust and 24" waist to a 44" bust and 38" waist. Thanks to the loose fit and dropped shoulder I knew there wouldn't be any real problems in this area. However, I made the adjustments to ensure the shoulder seams sat centrally across my shoulder. The sleeves were also nice and long - great for someone with long arms like me. The length combined with a wide cuff add to the cosy, comfy feel and look of the sweater too. An incredibly quick and easy sew I made the entire garment on my Babylock Desire 3 coverlock machine. Every time I cover stitch a hem I do a little happy dance. Perfect results with minimal effort every time. Yes! The hi lo hem was a fun little detail to work on and came together nicely following the comprehensive instructions provided by team Tilly. I shortened the neck band slightly, maybe 1/4" to make sure it pulled the neckline in. I stabilised the shoulder seams with this narrow ribbon. A top you can whip up in no time that is easy to fit and easy to wear. I'm already planning Nora number two - the Tshirt version. Once I'd made the Nora top I needed another skirt to wear with it. I had a couple of old, tubular, pull on jersey skirts in the wardrobe, but they were a panic buy a few years ago and I never really liked the fabric. The sort of mistake I used to make regularly pre-sewing. Tut tut. The Jalie Lisette Skirt (3883) was just the ticket. Options for different lengths, a panelled effect for colour blocking and a wide or no waistband. I chose the wide waistband view with no panels in the longer length. 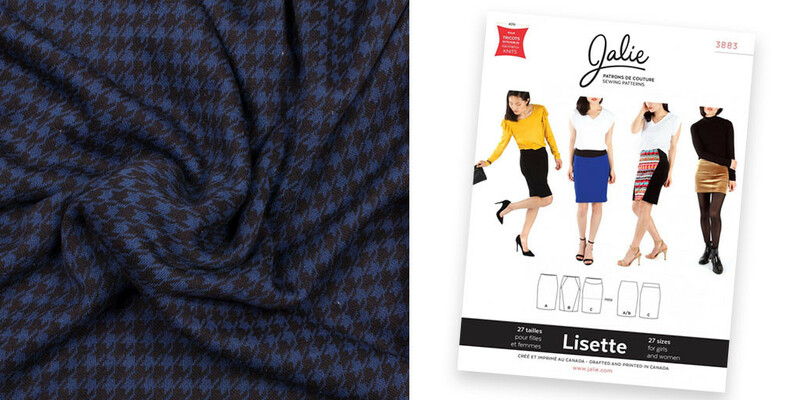 The fabric is a lovely, warm puppytooth ponte in black and royal blue. Soft and comfortable. You only need just under a metre of fabric to make the skirt, which is another bonus. We have a a few metres left of this lovely ponte plus lots of other great options here just check the descriptions to check the fabric type. I also thought our stretch velvet would make a rather lovely version. I cut a size T for a 29" waist and 38" hips with no need for any adjustment. The construction was lovely and simple and it took no time at all to sew. In hindsight I didn't think to pattern match between the waistband and skirt, but I don't think it is too noticeable. Another very quick and easy make I'm sure I will go back to time and time again. A great pattern for beginners who want to try sewing with knits or jersey and experienced sewers who need something quick! The wide waistband is flattering and comfortable to wear.